Historical preservation is becoming a more viable option for both commercial and residential properties. 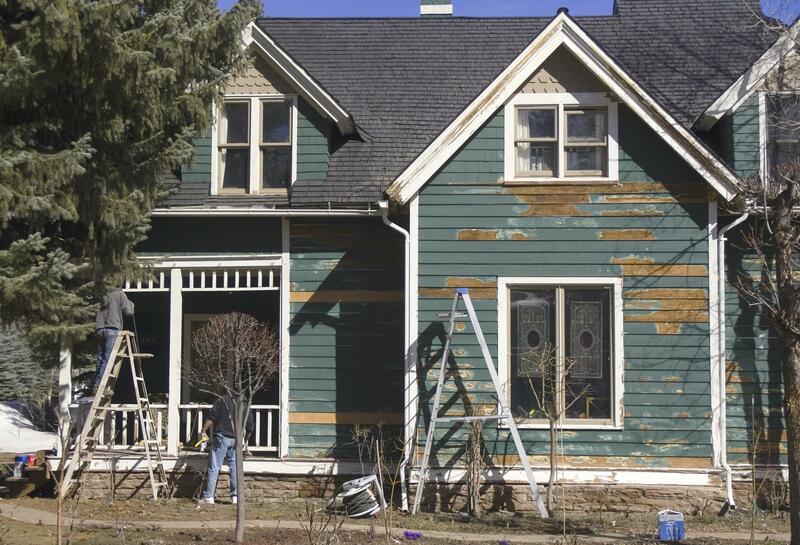 There are several benefits gained from restoring a historical building to its original condition, compared to tearing it down and building a new structure. The most obvious is the conservation of resources and materials, since there are fewer materials required to restore a building. Another benefit owner’s gain is any cultural significance the building offers in the community. Some buildings may have a rich and deep history, such a museums, wineries, and carriage houses. Other such buildings tend to reflect the architectural influences of the past and, by restoring these structures, it allows their history to be shared with future generations. In addition, the revitalization of historical buildings can help support growth within local communities. Historical neighborhoods often attract tourists who are interested in the beauty, charm, and history these buildings hold. As a result, increased tourism for a local community means increased revenue and growth, as well as potential investments by others into the preservation and restoration of other historical buildings. Plus, it allows local communities to hold festivals, art fairs, and other community events to attract people. Achieving authentic looking results requires doing a little research and learning about the history of the property you are restoring. Valuable resources are local municipality records offices, descendants of the original owners, old real estate listing records, and so on. There could be pictures, blue prints, and other documentation to help determine what the exterior and interior of the building looked like when it was first built. The historic firehouse pictured above was renovated and repurposed into a fire safety museum. Unsightly overhead garage doors were installed in the 1970’s but original blue prints in the city archives helped to restore the doors to their original swing style with heavy duty hinges. Using these resources allows you to find the right types of building materials, supplies, and specialty hardware to fully restore the building to its original condition. 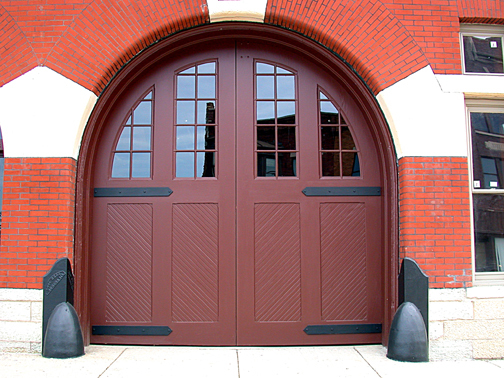 For instance, flat track door hardware was one of the earliest types of sliding door systems used in fire houses, barns, stables, carriage houses, garages, and other building with large doors. 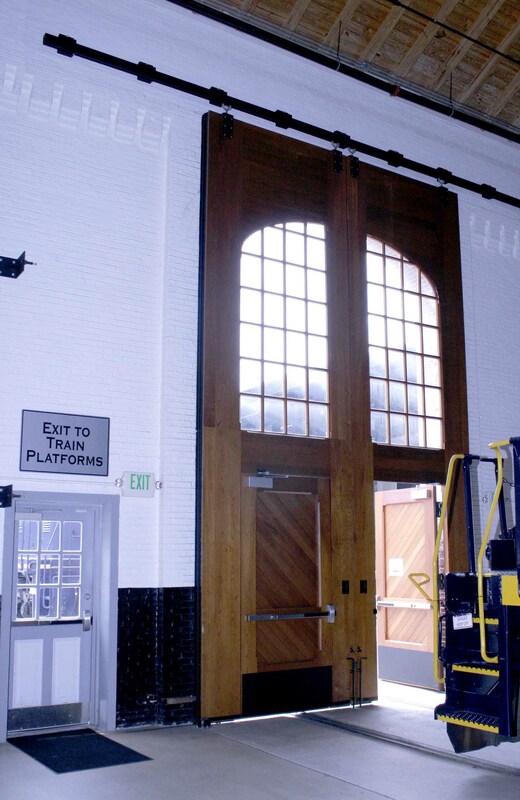 This type of door system was replaced with the development of enclosed boxed track systems, which were created by Richards-Wilcox Hardware Solutions in the 1930s. B&O Museum – Restored Roundhouse with Box Track support 24’ tall doors for antique steam engine access. Depending upon the age of the property, most designers and architects seek out original flat track or enclosed boxed track systems to incorporate into the restoration of historical buildings. Both of these types of rustic hardware provide an authentic look to the building. The only change in today’s hardware is the inclusion of safety features that were not part of the original flat track and enclosed box systems. In addition to these types of door systems, there are several decorative styles of hardware that can be used for interior doors within commercial and residential buildings. For further information about specialty flat track, enclosed box, and other door systems, please feel free to contact RW Hardware by phoning 800-253-5668 today. Many of our products feature historical original designs to help provide authentic looking results as part of your historical building restoration project.